Thad I think this question should be moved someplace else. It doesn't fit the BQM heirarchy. 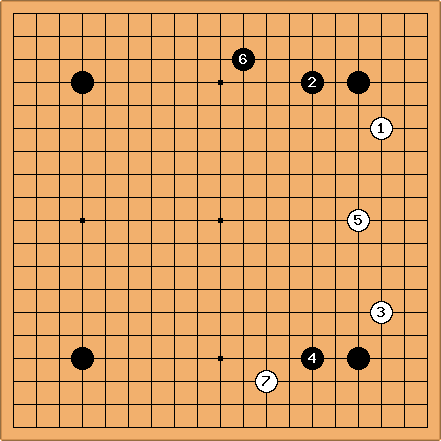 As for the question, a reading of any one, (or preferably all) of In The Beginning, Opening Theory Made Easy, and Fundamental Principles of Go should answer it. As well as several existing Sensei pages ( search for Fuseki ). I realize I don't have any specific GAME positions to offer, but that's because I tend to forget what game has what error. Sorry if this isn't allowed. In my games I tend to make major errors from established positions, i.e. blocking incorrectly on a 3-3 invasion to a Nirensei. This thread is meant to be more general, however, delving into the mindset one should hold in the Opening. I will freely admit to being a weak player (24k on KGS; that makes me a 27k AGA, right? ), but the root of my troubles in the game is that I make things rough for myself to start with. I'd like to know what the correct thinking is on several issues, but I'll be concise so as not to waste your time: I'll ask three things, one for the 4-4, the 3-4, and the 3-3. The 4-4 Point is speedy, supposedly, and I've read through the Joseki pages here at Sensei's, but sadly I have no idea how to approach it and deal with the subsequent sequence. Say in a 4-stone handicap game, how would WHITE play against the four Star Point stones? Zephyrus: Yes, that's usually what happens in my games, against anywhere from 20-30k. However, I'm talking more about the follow up. 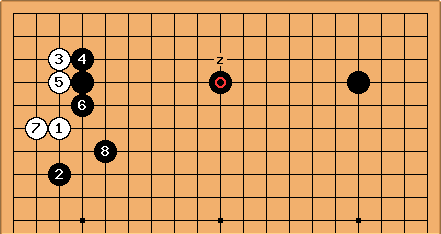 Assuming that Black takes the point 'b' next, or one space to the left, invading the 3-3 ('c') seems the usual move. From there the usual direction is to block above 'c', right? But what I was getting at, sorry for the vagueness, was White's follow-up to Black's moves... What happens after the 3-3 block? Alex: What you're talking about may be conventional at 20-30 kyu, but you'll almost never see it beyond the beginner level. I've put together a diagram showing what I think you're talking about. and are standard, but is rare. 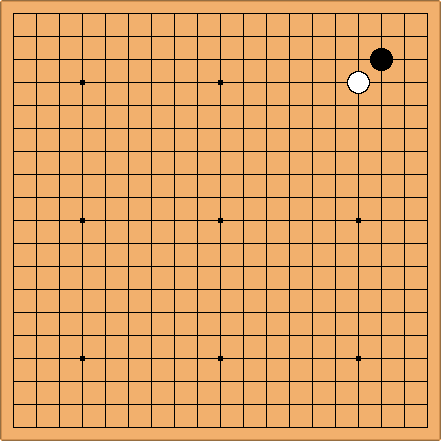 The idea of is to emphasize the top side; if White wanted the corner, she'd invade at immediately instead of inducing Black to reinforce it by exchanging for first. 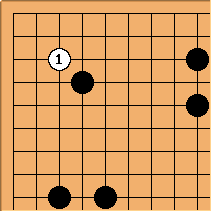 Instead of , White would usually play at a or b, though tenuki is seen a fair bit at higher levels of play. is horrible, because it makes redundant, way too close to Black's two stone wall. Black must absolutely play at c instead. White can make a big corner by linking up with c. Black must play at d now (making look even worse) because to let White play there would give her unimaginably good shape. Zephyrus: The thought came to mind, that the shape would be overconcentrated... For me, I always seem to concentrate on corners and then sides, like I read in the books I've owned. Extending to somewhere like 'b' has only recently clicked in my head. Bill: In four stone games you often see - , making a framework on the right side. 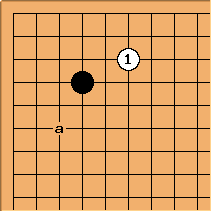 In this opening, after approaches Black's bottom right corner from the bottom side, giving Black some problems. zinger: Really should be played somewhere betwen and . This would be a multi-purpose move. But in a four stone game, black may be afraid to start a fight. BTW, in a handicap game, an early invasion of the 3-3 point is usually bad. Zephyrus: All I can really say is that the splitting attack looks good. I'll look through SL for some joseki on that one. The 3-4 Point... I like the Enclosure Opening, but whatever spot I enclose the other ends up deep in trouble. What is the purpose of a play here -- what does it say? How can it be used to squeeze the most use from it in a close game? PurpleHaze: I like "a" here. 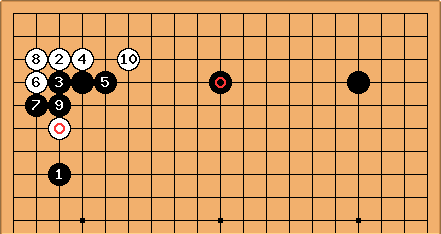 Zephyrus: Yeah, that 'a' point is good, as is the point above it in the diagram, but are there any specific follow-ups to the approach -- a trick play? Imagist: White will rarely allow you two enclosures. That's why I prefer the Orthodox Fuseki. That gives you a solid 3453 enclosure, and while the 4-4 point isn't exactly an enclosure, an immediate invasion at the 3-3 point benefits you more than the other person, so you have a good chance to make an enclosure there. If you really want two enclosures at the beginning, though, the 3-3 point is an enclosure by itself (though it develops too slowly for my tastes). Bill: This is a fairly common parallel opening pattern. See 3-4 point high approach, inside contact, hanging connection. The 3-3 Point I received some advice from a friend on, but it never seems to give much territory when I play it "the usual way" and I end up losing by tens of points. Are there any tricks or special traits that can be utilized for this point? PurpleHaze: I don't understand the question. The 3-3 point is a slow, solid move that gives a small stable corner. Use it when that is a good result for you. Zephyrus: Yes, but when would I aim for a 3-3? I don't know what the position of the surroundings would be like, say... the below diagram. 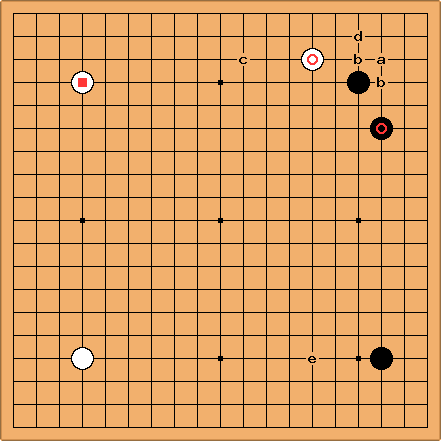 White has just made the circled approach at the 6-3 point, and black responds with a side defense (the Black circled stone). I usually would invade at 'a' next if I had White, leaving two general options at 'b'. 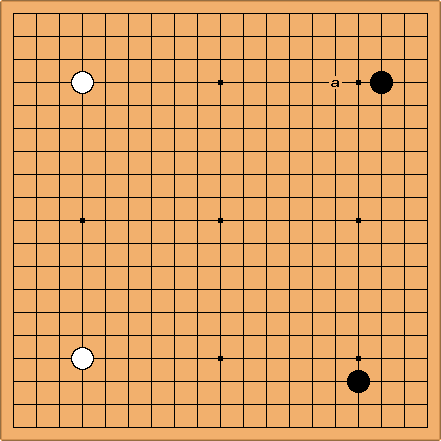 My question is that, in a parallel game such as the one shown, which direction should Black block? What direction should White seek life in? That sort of thing. Bill: A White invasion on the 3-3 is quite dubious. (BTW, Black should block on the top, cutting White in two.) Better an extension to c, which has a good relation to . White may also slide to d beforehand. Even better, IMO, is an approach to the bottom right corner, say at e.
zinger: If white invades at a, a black reply at the point below a would be very bad - see Alex's diagram "unwise play by both" and explanation. 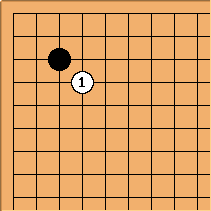 Black absolutley must block at the point left of a. Omni? : When during the course of the game your opponent gets strong in the area around the Hoshi, but the corner is still open, a san-san invasion is very big. A normal corner approach is unlikely to succeed, so taking the solid points in the corner is the best option. Very generally, the star point is for influence. The most usual approach is a keima ( or a). The idea is to undermine the corner and/or build a position on the side. 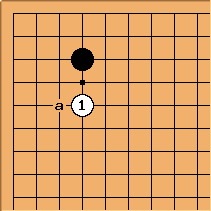 This approach gives black the influence he was looking for with his hoshi stone. 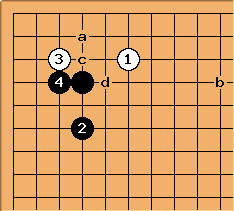 Since black can't close the corner with just one more move, a white approach move is nice, but not urgent. A stone on komoku can make a nice corner enclosure with just one more move. It is therefore fairly urgent for white to prevent this by playing that move herself. Most common are or at a. The sansan closes the corner and immediately makes territory for black. Since the converse of territory is influence, white generally plays to cover up the sansan stone with . 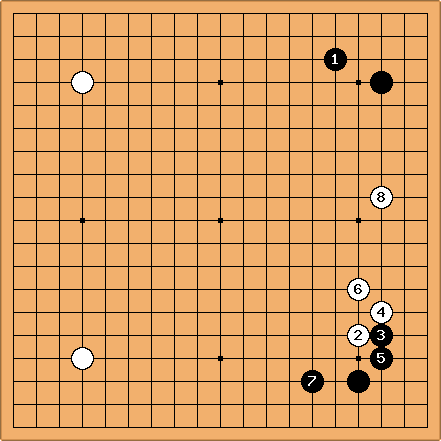 Since there is no particularly effective way for black to develop his sansan with just one more move, the covering play by white is also not as urgent as preventing a komoku-based shimari (corner enclosure). With the many go servers available for play, the best way to check these concepts out is to observe the games of some of the better players to see the kinds of plays they make. There are also any number of reasonable beginner books with good general opening advice. Zephyrus: I don't live anywhere near a Go club (darn you, Rockford area), so all I really CAN do is use a Go server. I also have a few texts for reading, but what I haven't done much of is observing better players during their games. I shall definitely try that more often. For the suggestion, thank you. And, for the explanations of what each move is, I thank you again. unkx80: Of course you are allowed to post questions. However, this question is fairly vague, so I do not really know what you want answered. Perhaps you want to see 4-4 point josekis, 3-4 point josekis and 3-3 point josekis. Also, I tried to improve the 4-4 point page, to make it more explicit about the approaches. Zephyrus: I read through the 4-4 point approach section and it was good -- thank you. The joseki pages I can understand, but what I'm running into problems with is "frame of mind" in the opening. Let's see, what's the word...? 'Positional judgment' of sorts but in the sense of 'use of joseki' and 'selection of movements'. The hane and knight's jump seem to get me in trouble early on, too, with cuts. I'll read some more for now, yeah? Thank you for your advice, each of you. Zephyrus: Yeah, I seem to have some problems with direction of play. Well, not 'some,' but 'almost every move' more like. Are there any books you can recommend that are currently in-print? unkx80: I suppose most books that deal with the opening (or fuseki) deal with direction of play. So you might want to look for books whose title contains the word "opening" or "fuseki". Maybe an example is in order here. This is a typical sanrensei opening. After enters the 3-3 point, both a and b lead to josekis. However, only one of the two blocks has the correct direction. Which is it? Zephyrus: I believe 'b' is the better choice, since it isolates . 'a' would lead to more of a complicated game because White could connect and run out... right? unkx80: Unfortunately, b exhibits wrong direction and a lack of understanding of the sanrensei. The point is, the center of Black's framework is at the top, and you want a wall facing that side. I will fork this into a separate page with more details later (or link to it if this example already exists). Black seals off white in the corner. The black formation on the left works beautifully with and the black hoshi stone in the right corner. White is going to have difficulty dealing with such a huge framework. Note that this is only good for black if is already in place. Otherwise, since white finishes the joseki on the left in sente, she will play at instead (or even better at z) and the ability of black's thickness on the left to do something big and useful will be seriously compromised. 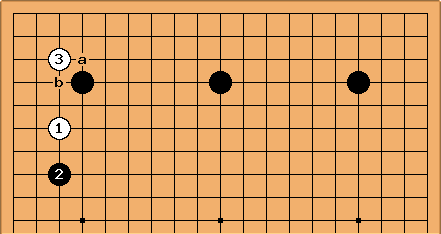 Black's position with the stone on the top is totally undermined. still has some aji which will make it tough for black to do something big in the center. 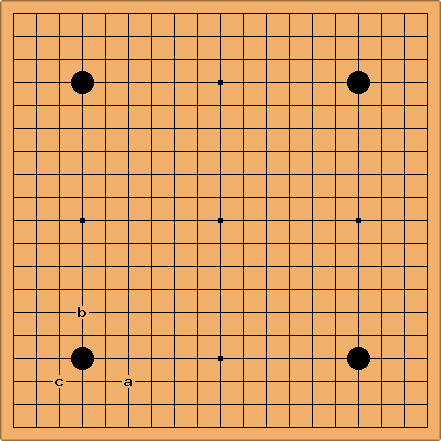 Black's initial san ren sei strategy is destroyed.